Is it really possible? Worthwhile? A waste of time, money or sleep? Let me tell you what we got up to and see if this helps you decide whether a day trip to Paris is something to consider. We set off at 5am from Warwick one cold Saturday in February for our day trip to Paris on Eurostar. I hadn’t been on Eurostar before and so was looking forward to the experience. We drove to a tube station on the outskirts of London and paid our £2 day ticket (for parking) and used our Oyster cards to hop on the tube to Kings Cross. We headed straight to check-in and found there was no queue. Our boarding passes were scanned and bags put through a security scanner and then within minutes we were in the boarding lounge. This area is nothing to write home about but it has lots of refreshments and a reasonable amount of seating. We only arrived half an hour before our 8:30am train left and so hardly any waiting time before being allowed to board. The journey itself is about 2.5 hours. You reach the tunnel in no time and within 15 – 20 minutes you reach France. We travelled in standard coaches and found them to be comfortable with lots of leg room but a little tired in places. They will also try and sell you metro tickets and other passes on board which are actually more expensive despite them mentioning a saving. The only thing they will save is time queuing up at the Gare du Nord and so you may consider an extra £5 worth it. We arrived just before midday and walked to our first stop of the day, Brasserie Julien, a restaurant we’d found online. I had been quite fussy with my requirements. I had searched for a long time for a restaurant which was traditionally French looking, had a good menu and at a reasonable price; we chose well. 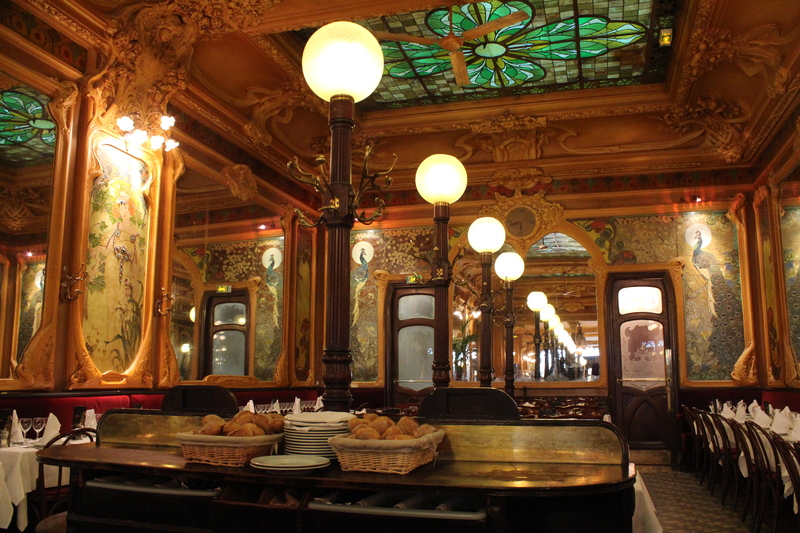 The food was delicious and typically French and the restaurant interior was stunning with a ceiling that reminded me of a Tiffany lamp, angelic paintings and large mirrors everywhere. There were a lot of locals dining and a few British accents audible. We spent 2.5 hours there enjoying the food and atmosphere and chatting to two local French women in broken French about our day trip. They actually bought us a glass of champagne at the end of our meal breaking at least one French stereotype. 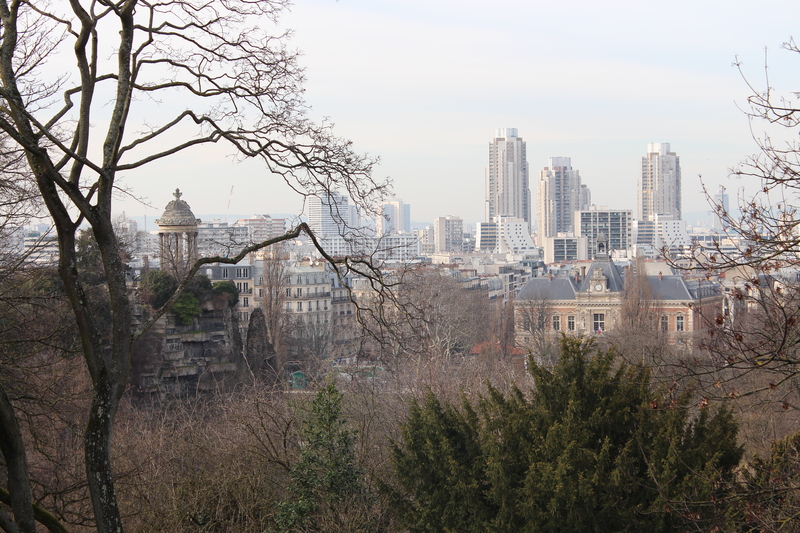 With our bellies full of food and wine, we decided to walk this off at Parc des Buttes-Chaumont (although we did catch a metro to the park to save time of course!). We spent a good half an hour strolling around the park…..well, strolling between the hiking – it’s a very hilly park! You are rewarded with beautiful and unique views across the city and you really feel a million miles away from the tourists. This was our third trip to Paris and so we were happy to steer away from the tick box attractions and we loved this park. It reminded me of Central Park and Hawkstone Park….something different around each corner – a suspension bridge was one of the highlights though. Sadly, a key viewing spot was closed when we visited but do trek to the top…..the views will be worth it. If you have more time, bring a picnic here in the summer. After a bit of fresh air, we were ready to hit the galleries. 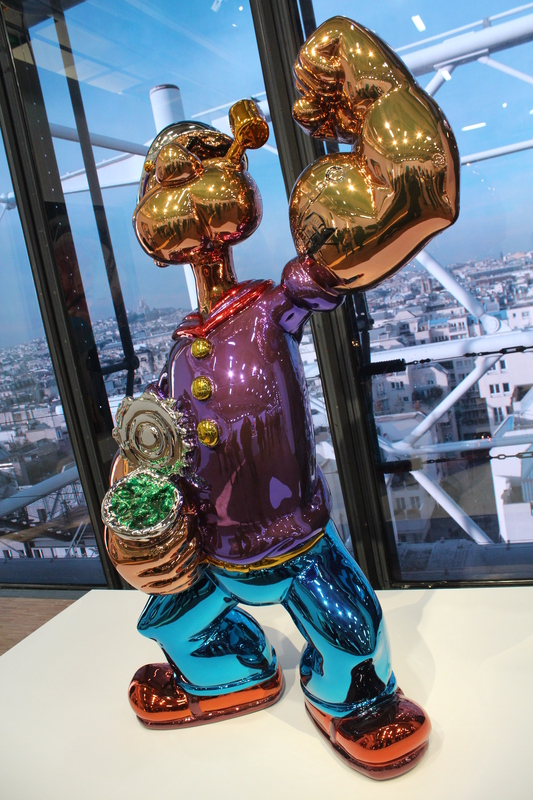 We have visited the usual suspects but there was one gallery I had wanted to visit for a while as my love of modern art has grown – Centre Pompidou. It’s not necessarily a cheap gallery to visit but I loved it. It’s wacky, makes you stop and think and it’s fun to look at. We spent just under 2 hours here smiling, being creative with our photos and deep in thought and I would recommend this to anyone who like modern art or something a bit different. 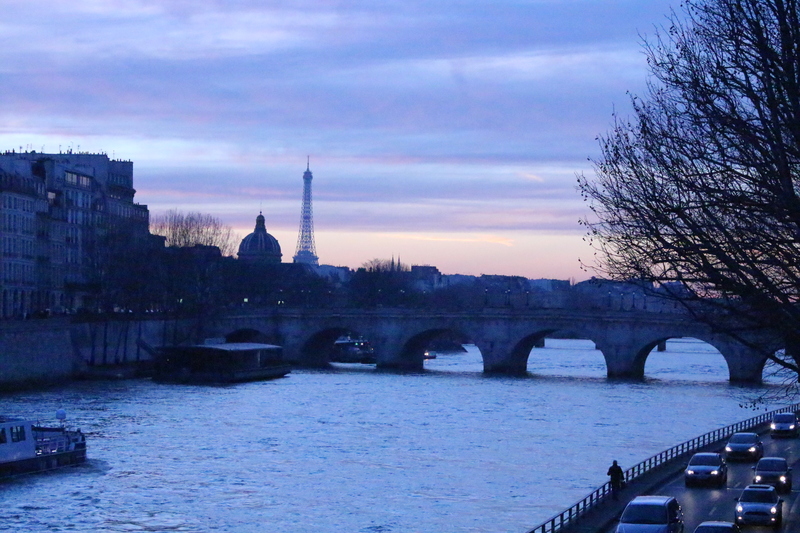 At this point, we didn’t have much longer in Paris before we had to be back for our 8:10pm train home. 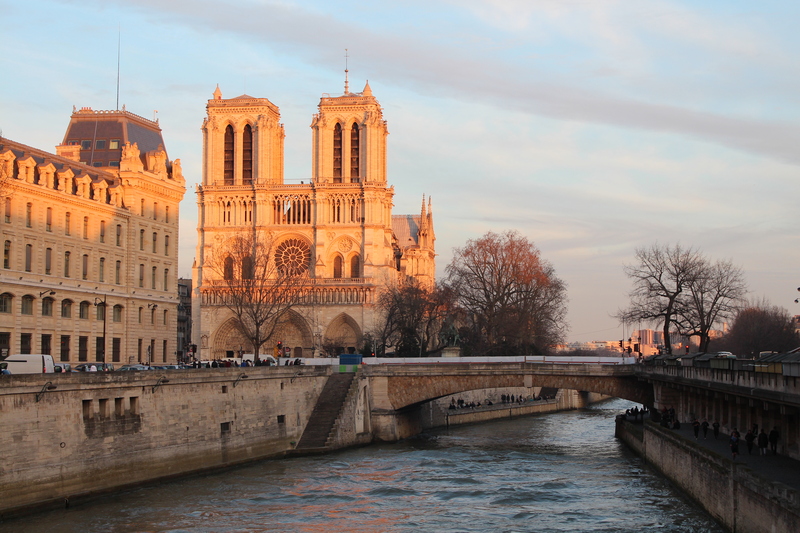 As the sun was setting we made a mad dash to Notre Dame and headed under the bridge, down to the river to catch a sunset photo of this stunning church from a different angle. 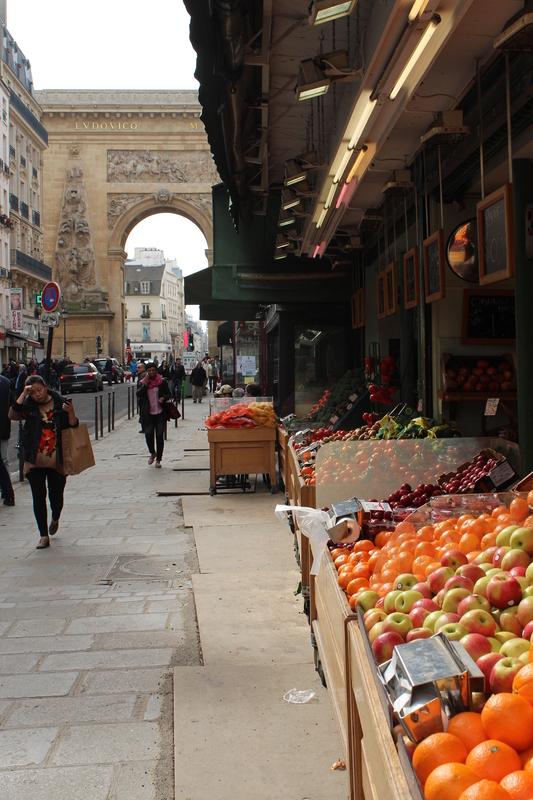 This is one of my favourite areas of Paris and so it felt almost homely to be back again. Heading back to the Gare du Nord we felt happy and content and felt we’d squeezed every last drop out of our day. The alternative…….a day cleaning at home or watching TV? I know what I’d choose every time. Yes, the early start and travelling is difficult (especially the drive back to London at 10:15pm after such a long day!) but the rewards far outweigh it and we got to have a lie in the next day. If you’re travelling to Paris, go by Eurostar rather than plane – almost certainly if you’re going for the day. The security process is quicker and more efficient, the cost is much less, there are no weight limits and it’s so easy to use. Make sure you book in advance as far as possible to get the best rates. 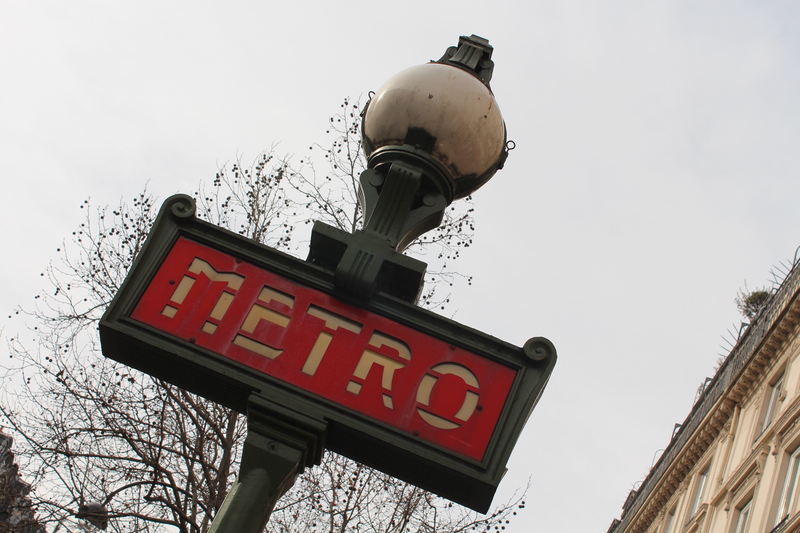 If you have a few minutes, buy your metro tickets at the Gare du Nord and buy a ‘carnet’ of 10 tickets between 2 if you’re there for the day. We like walking but we also had some things we wanted to see and do which weren’t close together and the metro was very handy. You can achieve a lot in a little time by planning well. We have the advantage of knowing Paris a little but we know from past experience that whenever visiting somewhere new, you get to know a city better by looking at map, getting familiar with what there is to see and do, when things are open, entrance fees, tube stations etc. Day trips like these are fun. They are different to the run of the mill Saturday. You don’t need to pack. You can feel like you’re a million miles away in just a short time. It doesn’t have to be expensive but you can splash out if you want to.